We spent over 15 hours researching and testing 13 different popcorn makers and found that popcorn making capacity, cooking time, and materials were most important. 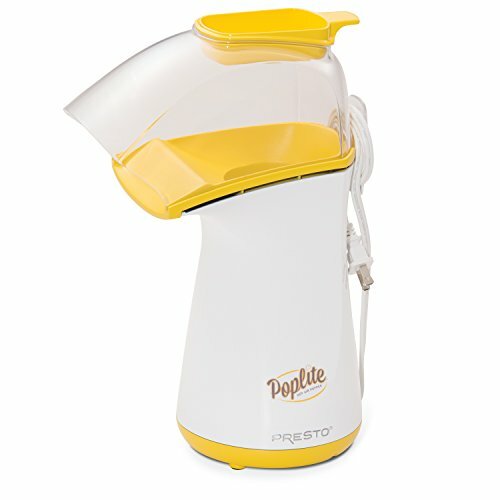 The Presto Poplite Hot Air Popper scored high marks in all categories and is our top pick. Using this popcorn popper was super easy and fun too. It produces 18 cups of popcorn in just 2.5 minutes. This was much more popcorn made in a lot shorter time than all the other popcorn poppers we researched. We could pop regular and gourmet popcorn with great results every time. We could melt butter easily in the top for buttered popcorn in minutes. Popcorn is a very popular snack. It is easy to make, can be healthy, and has the combination between salty and crunchy that makes you grab another handful. Popcorn can also have a nostalgic affect as it takes you back to pleasant memories. It can be reminiscent of times you went to the movie theater or visited a carnival or the county fair. Traditionally popcorn was cooked in hot oil. In the 1970’s, a healthier version of popcorn was sought after and the hot air popcorn poppers were born. These devices reduce the calories of eating popcorn by 45%, making them a very healthy snack. Then came the microwave popcorn. Place the bag in the microwave and 3 ½ minutes later hot popcorn emerges. The trouble with microwave popcorn is the bag lining is made of material that when heated can be toxic. In animal lab tests it cased infertility and cancer. Though it has not been tested in humans, the EPA lists the ingredients as a carcinogen. The other factor with microwave popcorn is the actual ingredients which contain a number of oils and artificial flavors. This reduces and sometimes eliminates the healthy benefit of popcorn by taking a normally healthy snack and creating a high calorie food. We all love popcorn, and if we are going to give up the microwave brands, how can we still enjoy this snack in a fast and convenient way? Fortunately dozens of companies have responded to customers call for a healthy and convenient way to cook popcorn in the home, without the high calories and unhealthy additives found in microwave popcorn. Today there are so many options among popcorn makers that choosing a brand and style can be overwhelming. We have studied and tested popcorn makers. Consulting with professionals, internet research and customer reviews we have narrowed down our list to the top three popcorn makers that are convenient, fast, and easy to use. They create healthy popcorn consistently and get rave reviews by chefs and home cooks alike. Our objective is to save you both time and money, while helping you to select which popcorn maker will be best for your family. We have done the testing and the research and created a guide to buying popcorn makers as a reference. Read through all the aspects of popcorn makers that matter and you will be popping this healthy and fantastic tasting popcorn in no time. The Presto Poplite Hot Air popper is actually faster than a microwave. It will cook 18 cups of gourmet popcorn in 2 ½ minutes. This is a top pick because among hot air poppers it pops more kernels and pops them 30% faster. Both regular and gourmet popcorn can be used. This will save both time and money, as it can reduce popcorn costs by nearly 70% compared to microwave bags. The advantage of the Presto Poplite Hot Air popper is that is does not require any oil for cooking. This will reduce calories by up to 45%. The popper is easy to use and only needs to be plugged in to start and unplugged when the popcorn is finished. There is a ½ cup measuring cup on the top of the popper that can be used to measure popcorn as well as melt butter while the popcorn is popping. This will allow you to have hot buttered popcorn, if you choose. The plastic chute directs the popcorn into a bowl of your choice. 18 cups amounts to around two bowls of popcorn. You can adjust the amount of popcorn that is made with the number of un-popped kernels that are used. The Presto popper comes with a one year warranty. The product will last from 5 to 10 years if cared for. When it needs to be replaced it is usually because the plastic chute becomes dried and cracked over time and use. One of the challenges with hot air popping is that there is no oil for the salt to stick to. For those who like salt, there is the option to use cooking oil spray and spray the bowl. Add popcorn salt (which is finer than table salt) or other seasoning and sprinkle it into the bowl. Then when the hot kernels hit the bowl the oil and salt will stick to the popcorn and season it. This method does not add a lot of calories to the healthy snack, but allows you to have the salty and crunchy snack that makes popcorn such a popular choice. 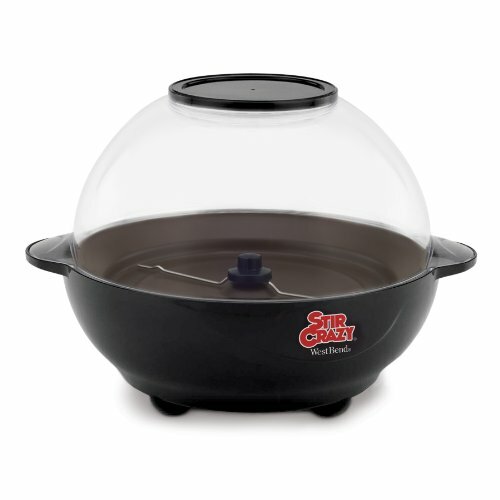 The Westbend 82306 Stir Crazy Electric Popcorn Popper will pop 6 quarts of popcorn in just a few minutes. The unit pops 25% more corn than most poppers and uses less oil. The popping surface has a nonstick coating requiring only a small amount of oil for flavoring. It has a built in well to melt butter, it is best if the butter is at room temperature when placed in the well.The Stir Carzy comes with a one year warranty. The unit is operated by simply plugging it in. You can pop popcorn and roast nuts or coffee beans. The top lid can be converted into a serving bowl reducing the cleanup. The unit can be cleaned with a paper towel. One unique feature of the West Bend Stir Crazy popper that sets it apart from others is the stirring rod. During the popping process a rod slowing spins inside the unit. This eliminates popcorn from burning and stirs the un-popped kernels. As a result there are few, if any, un-popped kernels when the cooking is complete. Popcorn is ready in less than 5 minutes. You can pop healthy popcorn by using only 1 tablespoon of oil for every ¼ cup of popcorn. Regular or gourmet kernels can be used. The butter well has small holes in it allowing the butter to seep into the popcorn bowl. This allows the butter to be evenly distributed among the popcorn without getting too much in one area and not enough in another. The other unexpected feature is the ability to effectively roast coffee beans. Many customers use the popper as double duty for their bean and nut roasting needs, making this a unit that will get a lot of use. Especially if you like freshly roasted coffee. For customers who like the taste that added oil provides, but still want a healthy version of popcorn, this is an excellent choice. The Great Northern Popcorn Company Stovetop Popcorn Popper. This popper makes popcorn on the stove, but includes some of the features enjoyed in a separate popper. The Great Northern Popcorn Company popcorn maker is unique in a few ways. First it is a stove top popper with a patented stirring rod. This enables all the kernels to pop with the oil and seasoning being evenly distributed. This creates better tasting popcorn. The design of the popper allow the pot to get hotter than most poppers. The extra heat provides larger popped kernels. Lastly there are 4 steam vents on the top of the pot. This lets the moist air escape and provides popcorn that is crispy and crunchy. The Great Northern Popcorn Company Stovetop Popcorn Popper is an aluminum pan with a clip on lid and comes with a 5 year warranty. A stainless steel option is also available. Only 1 or 2 tablespoons of oil is needed, providing a very healthy snack. The popping takes around 3 minutes and will pop up to 5 quarts of popcorn. The cleanup is easy. For regular popcorn you can simply wipe it out with a paper towel. Many different types of popcorn can be made in this machine. From regular kernels, gourmet popcorn to fancy varieties like caramel popcorn or kettle corn. The stirring rod will also allow you to roast coffee beans or nuts. The only down side is that you must remain with the pot and crank the handle for the 3 minutes it takes to pop the popcorn. Each of the three top picks utilize a different cooking method, but each is the top of their popcorn popper style and produce excellent results. They are the leader of their style among popcorn poppers. The Presto air popper will produce popcorn with the lowest calorie count, unless you add butter. The Stir Crazy and Whirley-Pop only use 1 to 2 tablespoons of oil so the calories among the three will be very close. Adding butter, salt and other flavors or seasonings will also impact the total number of calories in the finished product. The other main feature that customers care about is how long it takes to pop a batch of popcorn. Microwave popcorn takes around 3 ½ minutes. The Presto air popper only takes 2 ½ minutes to cook. The Stir Crazy and Whirley-Pop take 3 to 4 minutes to pop up to 6 quarts of popcorn. This makes all three options comparable to the time it takes to pop popcorn in the microwave. Clean up on each of the top three picks is very quick as the units just need to be wiped down with a paper towel or cleaning sponge. Popcorn poppers have been around for over 100 years. People love to eat popcorn because it is abundant in fiber and can be a healthy snack if it is cooked without a lot of oils or high calorie additives. Popcorn on its own provides a salty and crunchy snack that is easy to make and fun to eat. It also has a neutral enough flavor that you can add seasonings that are either sweet or savory and really add a lot of variety to this simple snack. Popcorn poppers offer an alternative to microwave popcorn. The top rated units cook just as fast as microwave popcorn and are much healthier. For these reasons popcorn poppers have increased in popularity since the 1970’s, when healthy eating emerged as a concern. Over the last few decades concern over healthy eating has increased in awareness, which has led to an increase in products that produce healthy foods. Popcorn poppers are a favorite among those who focus on healthy snacks that are also full of flavor. Health Benefits include a lower calorie snack because when you cook the popcorn yourself you control the fats and oils that are included. There is also a wide range of low calories flavors that can be added to the popcorn offering a variety of flavors while still maintaining the low calories. Popcorn is a whole grain which contains fiber, which is needed for a healthy body. Whole grains lower the risk of cancer, diabetes and heart disease. It will also help you remain full longer and can potentially help maintain a healthy weight or help with weight loss. Popcorn is considered a good source of antioxidants with help with other health concerns like maintaining good vision. Speed. Popcorn poppers can create a healthy snack in around the same amount of time as microwave popcorn. With the ease of plugging in a unit, you can have fast, healthy popcorn in less than five minutes. Financial Savings.Making popcorn from scratch offers a very inexpensive snack that only costs pennies to make. It is much less expensive than using microwave popcorn and is also less expensive than most available snack alternatives. Homemade popcorn does include the initial cost of a popcorn maker, but after than the cost of popcorn kernels are much lower than the cost of microwave popcorn bags. For example, on Amazon, you can purchase a 5 pound jug of Orville Redenbacher popcorn kernels for $17.19. Each batch takes only ¼ to ½ a cup depending on how many quarts of popcorn you want to make. A 4 pound jug of Snappy popcorn kernels is only $10.98. On the other hand 28 bags of Pop Secret will cost $19.99. Naturally prices will vary depending where the popcorn is purchased. Variety. Popcorn lends itself to the creativity of adding multiple flavors, allowing you to add a lot of variety to the snack. Flavors that are salty, sweet or savory will all go well with the neutral popcorn taste. Making it at home provides endless options for trying new and adventurous flavors. Want it to taste like a potato chip add ranch flavored powder or Bar-B-Q powder. Want a sweet snack add Carmel or cinnamon seasonings. Cheese, salt and garlic are also popular choices. Hot Air Poppers are available for those looking to enjoy a popcorn snack without using any oils. Without oils and salt, popcorn becomes a very low calorie and a low fat snack that can be enjoyed in a few minutes. Provided you do not add oils and high calorie seasonings it will remain a healthy snack. A 3 cup serving only has 93 calories. There is 1 gram of 5, 3.5 grams of fiber and 3 grams of protein. With powdered seasonings available it is possible to add a lot of flavor without ramping up the calories. Oil Poppers provide most of the health benefits of the air poppers but are for consumers who really want to add a little oil to the popcorn. Oil can make the popcorn crunchier and will provide a small amount of oil base which provides a sticky surface for flavored seasonings to stick to. Most oil poppers do not use much oil. Generally a few tablespoons of oil are required. Once the oil is heated you can add the salt or seasoning to the oil and then as it pops the popcorn will be coated with the seasoning. A word of caution is that you do not need to add much seasoning to the oil to coat a complete batch of popcorn. If you pour or sprinkle seasonings on afterwards then more is needed than if seasoning is added to the oil. Two other key benefits to the Stir crazy oil popper are that you can put butter in the well on top of the lid and it will distribute butter evening over the popcorn. This again allows the use of smaller amounts of butter and a more even distribution so there are not some kernels that get soggy, while others are unbuttered. Lastly is the stir mechanism provides the ability to roast nuts and coffee beans. Stove Top Poppers are great for users who want to be an active part of the popcorn popping experience. The other two methods require the user to watch the process but are mostly a plug and go process. 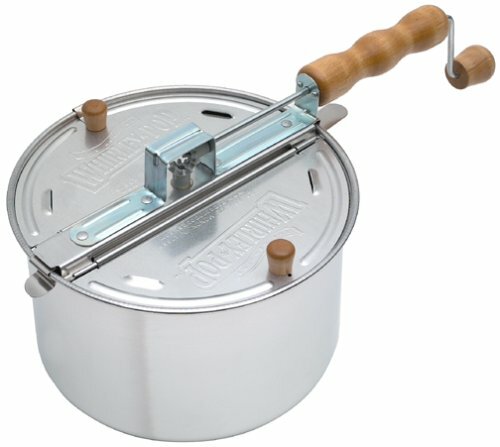 The stove top poppers require you to physically hold the pan and turn the crank in order to produce popcorn that does not burn. The stove top poppers must either be shaken or stirred during the cooking process. Oils needed are similar to the oil poppers, with only a tablespoon or two required. The seasoning process will also be the same with a stove top popper. What are Options for Healthy Toppings? Using butter over popcorn will reduce the benefits of creating a low calorie snack, by adding fats and increasing the calories by over 40%. Using healthy toppings can create interesting flavors as well as maintaining the crunchy treat and enjoying the health benefits. Spices like chili powder, cinnamon and garlic are popular flavor choices that add lots of flavor without adding lots of calories. These particular spices can also add additional health benefits and antioxidants. Popcorn seasonings can be found in a variety of flavors like bar-b-q, dill pickle and even salt and vinegar. These seasonings will give the popcorn a potato chip like flavor without all of the calories found in potato chips. Carmel and other sweetflavoring will give the popcorn a sweet taste. Each of these flavors can be found in a powdered form designed specifically for flavoring popcorn. What Are the Differences in Oils Used? The oils used during the popping process will make a difference in the overall flavor of the popcorn. Oils also burn at different temperatures and since popcorn popping uses temperatures above 450 degrees, the oil used will impact the flavor. Coconut Oil is one of the most popular oil choices for popcorn because it is thick and has a sweet and nutty flavor. It will last a long time without going rancid and is considered to be a very clean oil. Those with nut allergies should not use coconut oil. Soybean Oil or what is commonly known as vegetable oil. This is also a common oil used because of its neutral flavor. It will not add a taste to the popcorn but will provide an adhesive surface for seasonings to stick to. Canola oil is said to be the healthiest of the oil options. It is sometimes called Rapeseed oil and has very low saturated fats and contains beneficial omega 3 fatty acids. Canola oil is easy to find, inexpensive, and has a high tolerance for heat. Corn Oil is commonly used because of its mild taste. It is also one of the less expensive of the oils used for popping popcorn and is readily available in most stores. It has a mild corn flavor which complements the popcorn taste. Sunflower Oil is light in taste and contains vitamin E. It also has low saturated fat levels but includes preservatives to extend its shelf life. Peanut Oil is rich and nutty in taste and is considered one of the healthier options. It should not be used by anyone with nut or peanut allergies. Unlike most oils, it should be refrigerated after opening. What Determines the Quality of the Popcorn? The quality of the popcorn will determine how many kernels pop and how large they become once they are popped. Key factors that impact quality are the moisture in the popcorn kernel, processing procedures and storage. Popcorn is dependent on moisture. Each kernel of corn has a drop of water inside the kernel. The soft center is encased with the hard kernel or shell on the outside. When the popcorn kernel is heated the water expands and the popcorn “pops” turning the kernel inside out. If even 3% of the moisture is removed from the kernel either will not pop or a popped kernel will be very small. Moisture content of the kernels ideally should be from 13.5 to 14 percent. The drier the kernel is the smaller it will be when it pops and the more un-popped kernels you will have. With moisture being a key factor in the quality of the kernel, it is best to store opened bags of kernels in air tight containers. Do not store kernels in the fridge as there is little moisture. Without moisture the popcorn will not pop. If the popcorn is dry you can re-moisturize it with a simple process. Take ¾ quart of un-popped popcorn and put it in an airtight plastic bag. Add about 2 Tablespoons of water and shake to distribute the water among the kernels. Then let the bag sit for 1 to 3 days. This will rehydrate the kernels so they can be used for popping. Then pop as you normally would. The corns processing impacts pop ability. A good ratio is considered to be a range of 35 to 38 to one. Some of today’s hybrid brands and gourmet popcorns offer a ratio of 40 to one, with respect to the popped size of the kernel compared to the original kernel. While consumers have no way of following the popcorn processing, brand names can impact the quality of the kernels. In the case of popcorn, brand names really do matter with regard to quality. When measuring the number of popped kernels and the size of popcorn that is achieved, the least expensive brands and no name brands consistently have the poorest results. Better brands result in higher quality popcorn and better popping results. Even a great popcorn maker cannot recover from poor quality popcorn. Good quality popcorn should result in at least 98 percent of the kernels popped and should be at least 35 times its original size. What Types of Popcorn Kernels Are Available? There are two basic types of popcorn kernels. They are either butterfly or mushroom. The butterfly kernel is large, light and fluffy. When popped it looks like it has wings. The mushroom variety is a denser and compact and looks like a ball when it pops. Mushroom kernels are best used for caramelizing, popcorn balls, candy coatings and other treats. The two primary types of corn kernels are white and yellow varieties. Corn can also be found in red, blue, black or multicolored. Yellow popcorn, once popped can become as large as 46 times its original size. White kernels are smaller at 35 to 40 times. Yellow kernels tend to be fluffier and are butterfly shaped. White kernels are usually mushroom shaped when popped. White popcorn tends to be sweeter than yellow corn. Gourmet varieties can pop as large as 60 times its original size. Regardless of which popcorn popper you choose, each of these three options provides a healthy way to enjoy popcorn. Select the popcorn maker that best suits the way you want to cook the popcorn and then dress it up with a selection of seasonings, oils and popcorn types that your family and friends will enjoy.